Greetings again from the darkness. The pitch for this movie might have come across as blending a Greek tragedy with a romance novel, and then adding a dash of revenge. Fortunately director Paula Ortiz’s vision for the Federico Garcia Lorca play “Bodas de sangre” is more poetic and lyrical than such an overview would suggest. Love triangles are the core of many stories and movies, but it’s the opening sequence here that clues us in that the trouble has already occurred, and though it removes some of the suspense of “what”, it certainly sets the stage for an interesting “how” and “why”. 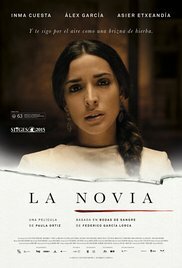 Inma Cuesta plays Novia (billed only as the titular bride) who is engaged to Asier Etxeandia (billed only as Novio, the groom). The abundance of family stress (on both sides) has little to do with the wedding plans, and more to do with Leonardo (Alex Garcia). Leonardo is more than the local hunk who is always lurking about on horseback; he’s also the third wheel who can’t let go of his desire for Novia … in spite of his young child and pregnant wife. To make things messier, Novia seems to answer his heightened desire for her with her own uncontrollable passion for him. It’s Yin and Yang. Safe and Dangerous. The bride’s conflicted choice leads the groom’s mother (Goya winner Luisa Gavasa) to be a foreboding presence throughout, and keeps most of the village on edge. Additionally, there is an element of mysticism as Maria Alfonsa Rossa appears periodically as the figure of death – and we are never quite sure of the motivations behind her advice. Goya winner Miguel Amoedo provides beautiful cinematography that balances between fantasy, harsh realities, and the romance of the moment. There are many intimate close-ups, as well as some stunning desert wide shots of Leonardo riding the horse. The score and soundtrack are terrific, including Soledad Velez with a haunting version of Leonard Cohen’s “Take this Waltz”. The concept of destiny vs. choice hovers over most scenes, and the twisted family and childhood histories give the film a Shakespearian feel. Last year, the film received numerous Goya nominations (including Ms. Cuesta, Ms. Ortiz, Mr. Garcia) are resulted in the wins for Ms. Gavasa and Mr. Amoedo. It may not make the best Valentine’s Day date movie, but it is an interesting watch from the romance-tragedy-revenge-horseback genre. This entry was posted on Thursday, February 16th, 2017 at 9:03 pm and is filed under Drama, World Cinema/Foreign. You can follow any responses to this entry through the RSS 2.0 feed. You can leave a response, or trackback from your own site.